Nashik is a popular tourist destination and a place with great religious significance for Hindus. But the city offers much more than that to its visitors. Those who come to the city looking for rest and recuperation too have a lot to look forward to. This wine capital of India has some of the finest vineyards in the country, which are maintained beautifully and hold events such as music festivals and grape stomping opportunities for their visitors. Let’s look at some of the things to do in Nashik, when on a visit here. Nashik is where the Godavari river originates. This is also one of the four major places where a Kumbh Mela is held every 12 years, when millions of Hindus travel from distances wide and far to come and take a dip in the Godavari, to ensure their salvation, and pray for the souls of their forefathers. Most people visit the Ranghat at Panchavati for this purpose. If going to temples is your thing, you have a lot of temples here which deserve a visit from the devout. Foremost among the temples in this historically-important and religious centre are the Kalaram Temple, Sundarnarayan Temple and Naroshankar Temple with traceable antecedents to ancient times. The stunningly-designed and architecturally-amazing Dharmachakra Parshvanath Prabhav Jain temple complex and Muktidham Mandir have been built in more recent times. Definitely one of the best things to do in Nashik, the Pandavleni or Trirashmi caves are 24 ancient caves which were used by Buddhist monks. These rock-cut caves are over 2000 years old, as they were in use between 3rd century BC to 2nd century AD by the monks of the Hinayana Buddhist sect. One more cave which must be visited in Sita Gufaa, which is where Ram, Lakshman and Sita were supposed to have lived during their vanprastha. You also get to see the place from which Ravan is supposed to have abducted Sita. Like all hilly terrain, Nashik also enjoys the tinkling music of waterfalls from their heights. Go close to nature and visit pristine surroundings with teeming bird and animal life and verdant greenery when you go trekking to visit the Dugarwadi and Someshwar waterfalls near Nashik. Thanks to the abundant rains during the monsoons, these waterfalls attain an impressive amount of power and need to be respected and approached with due care. Nashik offers opportunities for going trekking to enjoy the scenic beauty around Nashik and spend time absorbing the history of the region and the valour of the Maratha kings who defended the region. Trek to Kalsubai or Anjaneri for its beauty or the Ratangadh or Harihar Forts close by. The choice of places where you can go trekking increases when you are willing to travel a little farther from Nashik. There are very few places where one can enjoy whitewater rafting and Nashik is one of them. Get that rush of adrenalin as you careen down the swift currents in a raft and wok furiously to stay afloat. Nothing can beat the adventure of such an experience and makes it one of the things to do at Nashik. Smell the bouquet, swirl, sip… We all know that wine tasting is an art and many of us have wondered if we have possibly missed out on a great career as wine-tasters due to our lack of awareness, of wines and such opportunities. Nashik helps you find out if these were just pipe dreams, as the wineries here offer wine tasting opportunities and tours to their visitors, so they can check out this charming alternative profession. 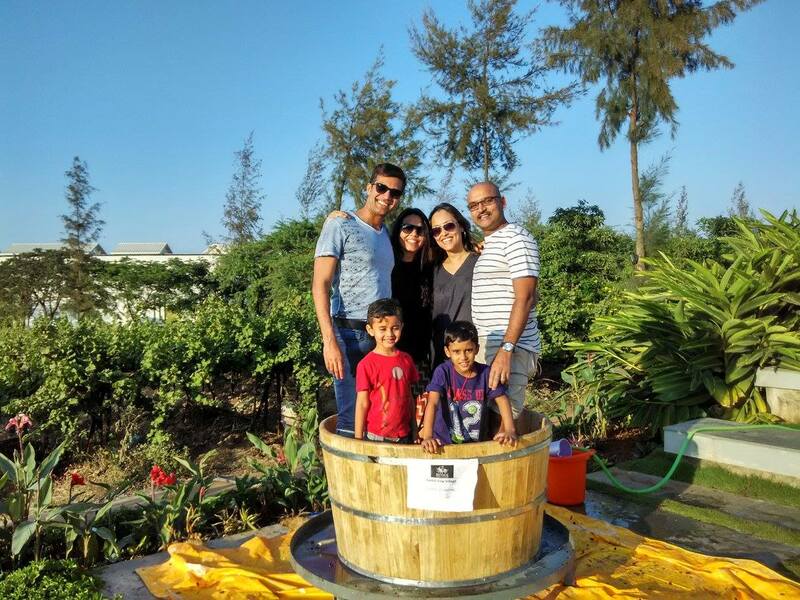 Grape stomping is an important step in the traditional process of winemaking and you could actually get to be a part of this event by visiting Nashik between January and March. The experience will be completely worth it, as you get to enjoy the pristine atmosphere of these large vineyards and see grapes being harvested and have oodles of fun by squishing them with your clean feet and double it by holding hands with a friend. Trips are incomplete without efforts being made to collect some physical memories in the form of souvenirs or gifts. The bazaars at Nashik offer souvenirs in all forms: clothes, objects of cultural significance, silver jewellery and amazing wines. Purchasing something is one of the best things to do in Nashik, so you will be reminded of happy times well spent. If fond of authentic Indian cuisine, especially from Maharashtra, Nashik is the place for you to explore in the style of Epicurus. This list includes a variety of chaat, many sweets, Tibetan delicacies like Momos and the Arabian specialty Shawarma. Eating street food is the thing to do at Nashik, as it offers you a journey through the traditional features of Indian food all the way to its more recent additions like wraps, sabudana wadas, debelis and jalebis as snacks. Make your trip to Nashik memorable by choosing to indulge in one or more of these things to do at Nashik and take home a bagful of good things and a mind full of wonderful memories of your adventures at Nashik. Nothing compares to a well-planned and well-executed holiday in the amount of satisfaction it affords us. So make sure that you have planned every minute of your trip to Nashik well and to the last detail.